Yesterday was the day we started mid-west and ended up west. We started our trip at the most eastern end of the Central Time Zone. Right now as I type these words in our tent, we are at the most western end. Big difference in sun-set times; last night about 10. Given that we are almost exactly 800 miles west of Chicago (and only a tad north) I know the difference in times can be attributed solely to lateral travel. The route to Valentine was what I suspected it would be. Two lane (one each direction) and alternating between flat and hilly ranch las well as some corn fields. Besides the hillier nature the land had a decidedly more cowboy feel to it than it did in Iowa. Maybe it was the squared off nature of those hills or the lack of humidity. Trees were also smaller and less common and at times it all felt like a high desert. By the time we got to Valentine we felt exhausted by the day and searched a while before finding a former KOA campground run by the laid back and shirtless Mike. I understood pretty quickly why Mike left the KOA system; he was friendly enough, but swore more than my auto mechanic Bruce (and that man knows a few things about colorful language). 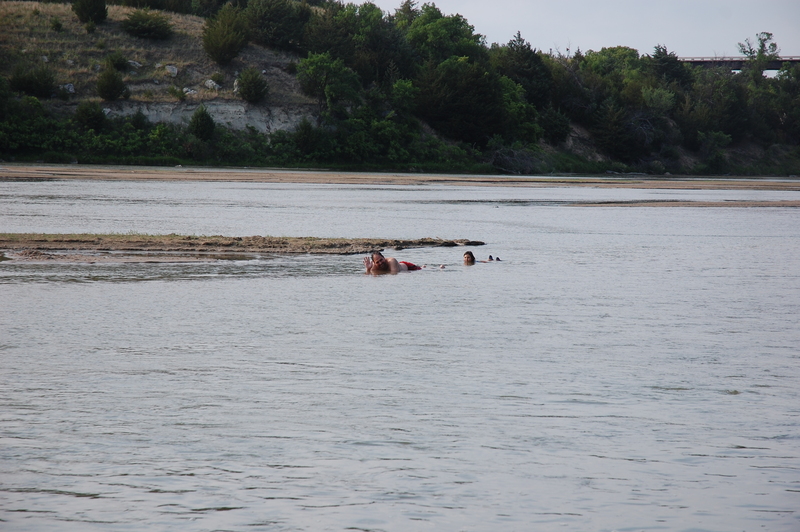 The campground was on the banks of the beautiful Niobrara river which, by us, was shallow and sandy. Henna and I had a lot of fun swimming there. On the way to Valentine we saw two wonders: the Klown Dolls Museum and Ashfalls State Historical Site. For the first I have to admit that after a few hours driving we were not too picky about our roadside attractions (although I kept thinking of the movie Dolls where killer dolls come to life; plus clowns can be a little creepy). 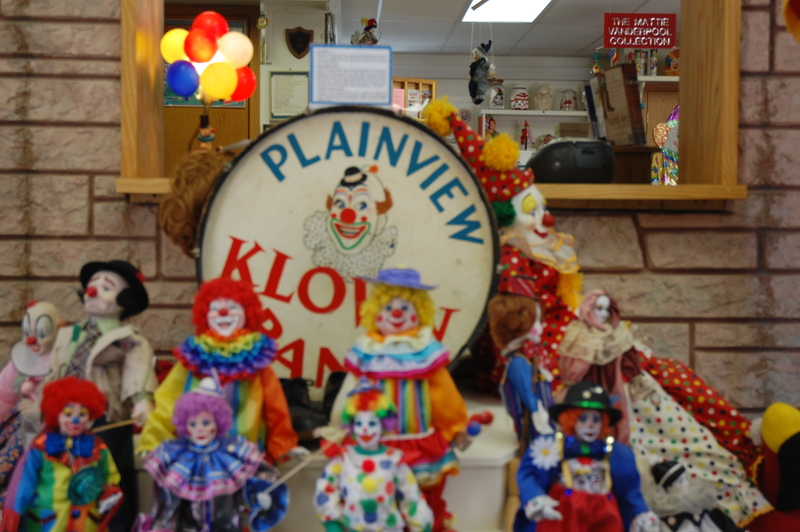 But inside the museum (located in Plainview, NE) are thousands of donated clown dolls. It started almost 60 years ago with a volunteer klown band (they wanted to be different so they spelled clown with a k) and grew to the marvel we saw yesterday. Ashfalls has a bit longer history. About 1.2 million years ago Yellowstone exploded (it is a giant caldera that erupts every million years or so) and sent massive volumes of ash pretty far west. 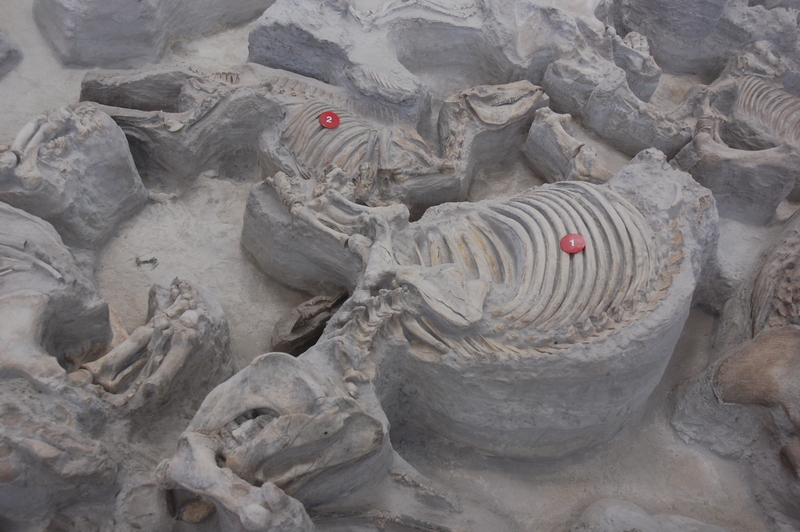 In eastern Nebraska there was a watering hole that filled with this ash and slowly (over about a month) choked prehistoric rhinos, camels, and three-toed horses to death. The ash hardened and preserved the remains better than a fossil (fossils tend to be flattened, these bones were more like in a plaster). 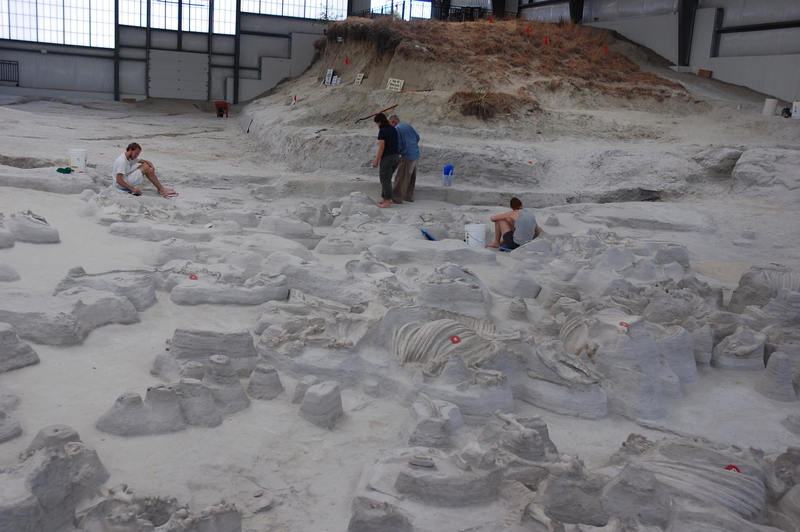 At Ashfalls a big barn was put over the excavation and you can watch a dozen interns work the earth with very delicate and small tools (the type you use to mold clay). Very, very cool. Making it even more cool was that one of the original archaeologists who discovered this place (“a bunch of bones sticking out of a farm field”) was there. A very modest and open fellow whose love for the place he helped found was contagious. So that is all for now. The ladies still sleep, this tent is getting warm, and I fear the bugs outside. Talk to you all soon. This entry was posted in 2012 Summer Trip, Cowboy West, Middle America and tagged Ashfalls State Historical Site, Klown Dolls Museum, Valentine Nebraska by hennacornoelidays. Bookmark the permalink. Henna has done a great job of keeping her fears at bay. Hope all is well. very cool description of ashfalls. Someplace I would definitely like to visit. The Nebraska river sounds very refreshing. We,re planning to canoe the Wisconsin in a couple of weeks. Will continue to follow your adventures untill we leave for Greece. Glad your not sore about me misrepresenting the time a bear chased you. Have a great trip to Greece. Sounds like your trip is off to a great start. The pictures are a nice addition. I am sure those klowns would give me nightmares! Ever see Killer Clowns from Outer Space? A classic. Hope you’re having a great summer. Not as creapy as I thought it would be. Actually sweet.